Just like whole turkeys, boneless turkey breasts come in a variety of sizes, ranging from about 2 to 3 pounds to more than 20 pounds. No matter the size, a benefit of the breast is that it takes less time to cook than a comparable whole turkey. 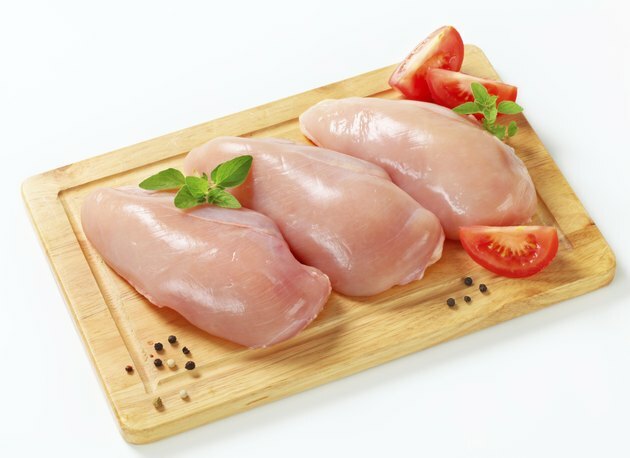 But lean breast meat can be a challenge to cook so it's moist and succulent, especially without the bones. Brining the boneless breast, which entails soaking the turkey in a solution of water, salt and spices, can help the meat to be juicy and tender. For best results, brine the turkey for 12 to 24 hours before cooking. Line your container with a brining or oven-roasting bag. Along with easy clean up, the brining bag keeps the water contained and helps to prevent it from leaking in the refrigerator. The container should be large enough to submerge the turkey breast in water; try a large stockpot or bucket. Pour 1 quart of water into a saucepan. Add ½ to ¾ cup of coarse salt. Salt is a key ingredient in brining, acting as both a tenderizer and a seasoning. Though salt normally draws moisture out of meat, as in a dry rub, when it's combined with water the opposite effect happens: The salt solution hydrates the turkey and helps it to retain its moisture. Add any additional seasonings and spices to the water that you like. Common choices are bay leaves, onion, garlic, thyme, coriander seed and mustard seed. Heat the mixture to a simmer; cook until the salt has dissolved. Remove the seasonings from heat and allow the mixture to cool for 5 minutes. Place the turkey breast into the brining bag. Pour the seasonings mixture over the turkey. Cover the turkey breast completely with additional cold water. Tie the bag so that it is securely shut. Place the pot or bucket with the turkey into the refrigerator; allow the turkey to soak for 24 hours. Remove the turkey from the refrigerator and brining bag 1 hour before roasting and season and cook as desired. Use a cooler if you do not have adequate space in your refrigerator to chill the turkey for 24 hours. Place the pot or bucket into the cooler and cover it with ice. Replenish the ice frequently; for food safety the temperature in the cooler should be kept below 40 degrees. Carefully discard the brining mixture when you are finished soaking the turkey. The seasoned water should not be used for cooking the turkey or for any other purpose.